One of our mama sows just had 9 piglets and we wanted to share this adorable video of her with her babies. Watch as the piglets nurse from their contented mom, who is utterly calm and just happy to be able to finally take a rest. You'll notice that the pigs are brown, not pink. That's because we raise breeds whose skin color is darker. We do this because our pigs are raised outdoors, and their dark-skin prevents them from getting sunburned. Often when the mother sows give birth (or "farrow") they just will lie there almost motionless for a long time because they are so tired. This is good for the piglets, as it gives them plenty of time to nurse and get off to a good start. 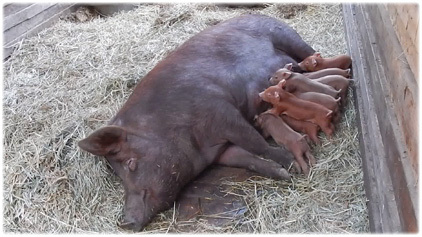 One of our mama sows with her 9 newly-born piglets. Amazingly, the sow in this video weighs close to 600 pounds. You'd probably never guess that, but pigs often weigh much more than they appear to. She's so big that she needs to be extra careful around her piglets, which are relatively tiny. We will raise most of these piglets until they are around 250 pounds. They are incredible creatures, and will have happy lives digging for roots and eating grass and lying in the sun, just as they were meant to. If you haven't placed an order for our delicious, healthy pork products, you can do so here. We believe you'll agree, it's the healthiest and most flavorful pork available in the Vancouver and lower mainland area.